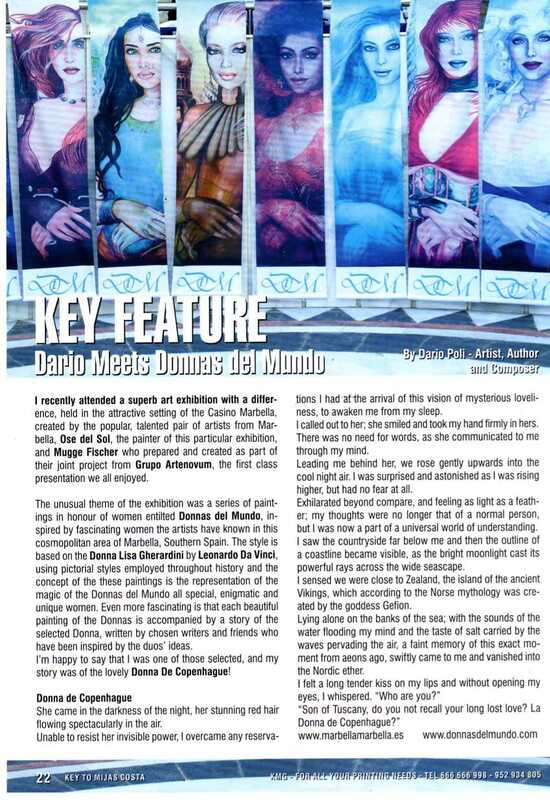 Key Feature – Dario Meets Donnas del Mundo | Marbella Marbella – Adelante! created by the popular, talented pair of artists from Marbella Ose del Sol, the painter of this particular exhibition, and Mugge Fischer who prepared and created as part of their joint project from Grupo Artenovum, the first class presentation we all enjoyed. 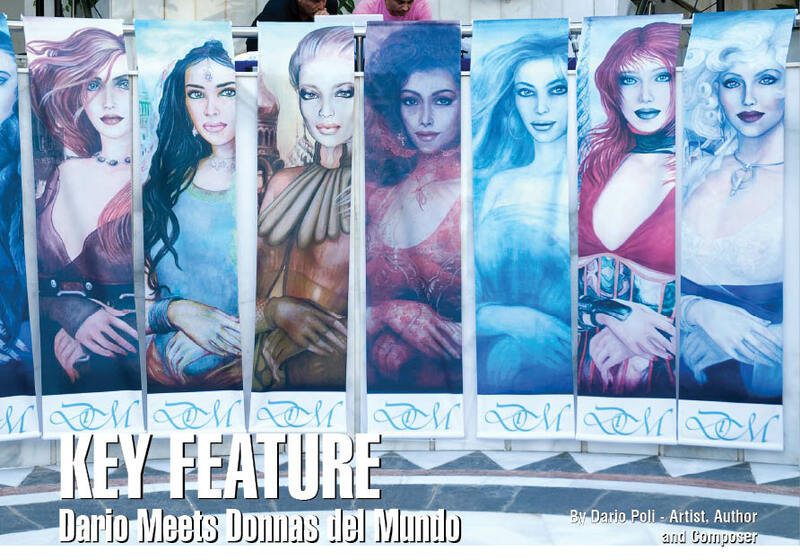 The unusual theme of the exhibition was a series of paintings in honour of women entitled Donnas del Mundo, inspired by fascinating women the artists have known in this cosmopolitan area of Marbella, Southern Spain. The style is based on the Donna Lisa Gherardini by Leonardo Da Vinci, using pictorial styles employed throughout history and the concept of the these paintings is the representation of the magic of the Donnas del Mundo all special, enigmatic and unique women. Even more fascinating is that each beautiful painting of the Donnas, is accompanied by a story of the selected Donna, written by chosen writers and friends who have been inspired by the duos’ ideas. I’m happy to say that I was one of those selected, and my story was of the lovely Donna De Copenhague! 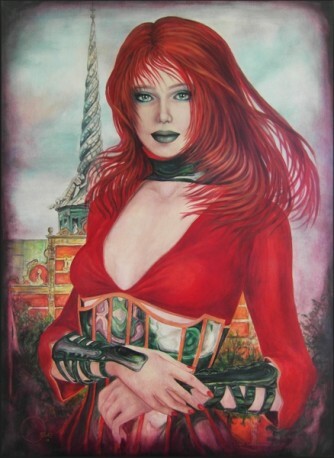 She came in the darkness of the night, her stunning red hair flowing spectacularly in the air. Unable to resist her invisible power, I overcame any reservations I had at the arrival of this vision of mysterious loveliness, to awaken me from my sleep. I called out to her; she smiled and took my hand firmly in hers. There was no need for words, as she communicated to me through my mind. Leading me behind her, we rose gently upwards into the cool night air. I was surprised and astonished as I was rising higher, but had no fear at all. Exhilarated beyond compare, and feeling as light as a feather; my thoughts were no longer that of a normal person, but I was now a part of a universal world of understanding. I saw the countryside far below me and then the outline of a coastline became visible, as the bright moonlight cast its powerful rays across the wide seascape. I sensed we were close to Zealand, the island of the ancient Vikings, which according to the Norse mythology was created by the goddess Gefion. Lying alone on the banks of the sea; with the sounds of the water flooding my mind and the taste of salt carried by the waves pervading the air, a faint memory of this exact moment from aeons ago, swiftly came to me and vanished into the Nordic ether.